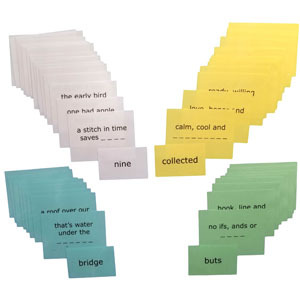 The game includes a set of 48 cue cards each with an expression missing one word along with the answer cards. 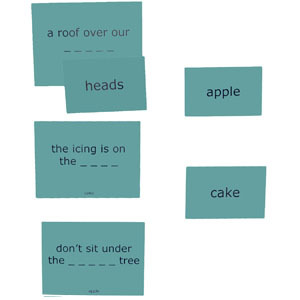 The cards are grouped by type of expression - either two words with the third missing ("Hip, hip, _ _ _ _ _ _") or an expression missing a word ("Don't sit under the _ _ _ _ _ tree"). Each group of expressions is further divided into sets so that the smaller sets can be used with individuals while the larger sets (or complete pack) can be used for group activities. Great for almost anyone with dementia or Alzheimer's individually or in small groups. There are four sets of cards and answers. 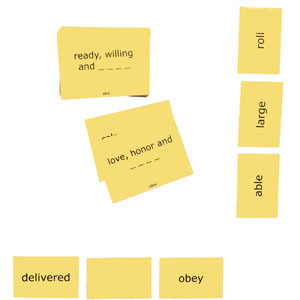 The yellow and green cards each have a 3 word expression that is missing the last word such as "calm, cool and _______". The white and blue cards have a common phrase that is missing one word which is a little more challenging. This allows you to mix and match the cards to vary the level of difficulty. There is so much that you can do with this activity. Start by simply reading one of the green expressions - the person will likely respond automatically. Increase the challenge a little by having the person read the expression themselves. Use the cards from the white or blue deck to make it even more challenging. 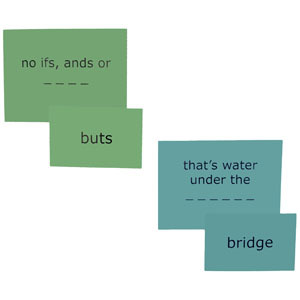 Put three expression cards on the table, along with the corresponding answer cards. Have the person read one of the expressions and find the matching answer. Increase the challenge by using more than three cards, or using cards from the white or blue deck. You can even put out some expressions without the answer cards to make it even more challenging. Give each participant three answer cards, placed face up in front of them. Have the first player pick an expression from the deck and read it out loud. Everyone can call out the answer and if anyone has the answer card, they turn it over. The game continues until all the answer cards are turned over (remember, we do not encourage games that have winners and losers). Add more challenge by using more cards or cards from different decks. Our "Expressions Bingo" product offers all of the same activities as Expressions, plus a a fun and challenging bingo game using the expressions as the "calling cards". 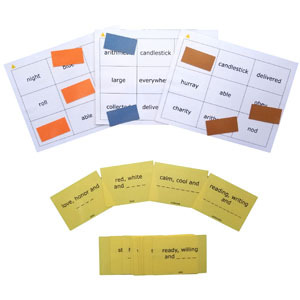 Expressions Bingo includes the same expression and answer cards as regular Expressions as well as 6 double sided laminated bingo cards and 54 colored bingo markers.